Members of Pattonville's transportation department took part in their first state bus safety competition and training in June at the School of the Osage Middle School in Osage Beach, Missouri. 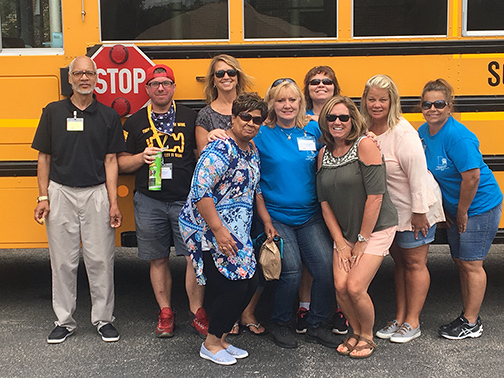 Bus drivers Herman Davidson, Regina Dunmire, Terrie Ivie and Brenda Vitale participated in the two-day Road-eo sponsored by the Missouri Association for Pupil Transportation (MAPT). This was the first time Pattonville was represented at the annual state-wide event for school bus drivers. Pattonville driver and trainer Rickey Jones also served as a judge. "Everyone who participated had fun, was able to network with their peers from other districts and gained valuable training experience," said Jennifer Simpson, Pattonville director of transportation. Simpson, along with transportation staff members Tammy Holzschuh, Rhonda Jones and Jeanette Pashia-Riley, attended the event to cheer on the Pattonville team. Last spring, bus drivers Davidson, Debbie Franklin, Vonnie Mack-Haley, Chris Poelker and Annedra Turner represented Pattonville at the St. Louis Regional Safety Competition held at Parkway Central Middle School. Davidson won third place in the rookie division at the St. Louis competition. Transportation staff are shown at the state bus safety event.